Would you listen to Elfkind again? Why? I would most definitely listen to Elfkind again. Catherine Cruzan's lush writing style and deft storytelling delivers a satisfying tale whose central themes are the gaining of maturity through loss, finding one's true self and finding true love. Andrea Emmes' narration brings the story to full, rich life through her talent for imbuing each character with a distinct voice. The growth of Lariel as a person was my favorite aspect of the story. The spoiled, pampered royal child at the start of her personal journey became a strong, skilled and respected woman by the end. Her transformation did not come without a heavy price, but she did not allow tragedy to break her; rather, she used it to forge her own unique personal strength. My biggest criticism of this book is with the narration. While Andrea Emmes does a very good job of giving the various characters distinctive voices, I found the performance too much like listening to an English language dubbing of a Japanese anime--overly theatrical in places, a little too stilted in others. Having said that, I liked her reading of Lariel the best. *SPOILERS* Don't read any further if you don't like them!!! The most moving scene in the entire book was Yvorian's death. It came as a huge surprise and it floored me. I had to stop listening for a bit to collect my thoughts and emotions. I consider this book to be a romance as much as it is a fantasy adventure, and for the few romances I will read, I want a good ending for the hero and heroine. In other words, they must end up together and happy. Lariel and Yvorian didn't get their happily-ever-after. They barely got ANY time together as lovers. Still, it was a powerful moment and ultimately made the story stronger. 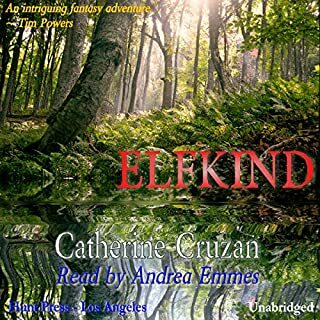 I read the print version of Elfkind before listening to the audiobook, so I went in knowing the story already. Having read the print version greatly enhanced my enjoyment of this audio version.